C-Line has long been known as an industry leader in the photo storage and protection market. Our photo holders are made from the highest quality acid-free polypropylene material to ensure archival quality protection for your most treasured photo memories. Peel and stick self-adhesive allows you to attach photos to files, binders, reports and much more. A clear finish protection creates a sharp, transparent finish. It is perfect for showcasing any materials with bright and bold colors. Top loading access system to keep 3 1/2 x 5" and 4 x 6" photos safe and protected. Cherish every moment with C-Line! Insert Size: Up to 4 x 6"
I have used these for years for my grandkids photo/scrapbook albums. Thankful they are still available. Delivery time is really fast. Welcome to MyBinding video. 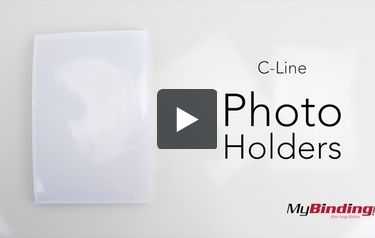 This is C-Lines Photo Holders. They are an adhesive pocket that fits photos perfectly. Just peel the paper back off and apply the pocket. You can apply the pockets to just about anything. Make sure to lay it down flat and press down on the entire pocket to make sure that it sticks. 4 x 6 photos fit very snugly and without long fingernails, it's a little challenging to get the photo out. You can put the photo holder even on the wall. It's very clear and does not degrade the image and when you peel it off, it doesn't leave a residue. For more demos, reviews and how-to's, go to MyBinding.com.